The Czech Airlines TU-104A OK-LDC at London Airport on 16th March, on the proving flight from Prague. Regular flights are expected in about a month. Rare Polish machine is illustrated here. 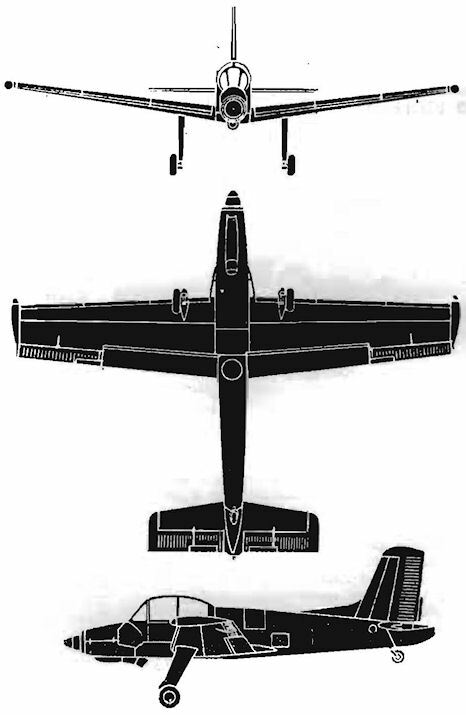 This is the PZL P11c. Jigsaw. The ground shadow gave the main clue to this aircraft, which is an experimental version of the Lockheed P-38 Lightning. The Piper PA-18A Super Cub 150 G-APKB, powered by a 150-h.p. Lycoming O-320 is unique as the first British registered example to reach these shores. It is fitted for crop dusting and is based at Panshanger. Dan-Air's Freighter 31 G-APLH, delivered ex-Weston on 31st March, left Blackbushe for Gibraltar with freight on the following day. Joining a Squadron. First you go to an Operational Conversion Unit. Soon after you qualify you are shaking hands with your new squadron commander. Your life in a bomber squadron has begun. PARNALL PANTHER (1917) Interest in this photo supplied by A. Tanner oj Northwood (Middlesex) centres on the Isle of Grain-developed emergency water landing devices: the vee-shaped hydrovane attached lo the main undercarriage (for use as a water ski) and the inflatable flotation bags. 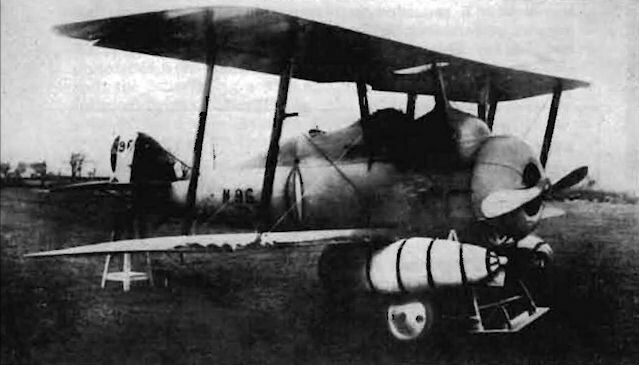 This was the sixth prototype of the carrier-borne 2-seat Parnall Panther, of which 150 production examples were built. Powered by a 230-h.p. Bentley B.R.2 rotary, this 29 ft. 6 in. span. Fleet Spoiler Reconnaissance biplane had a maximum speed of 108 m.p.h. Flying in the Missile Age. 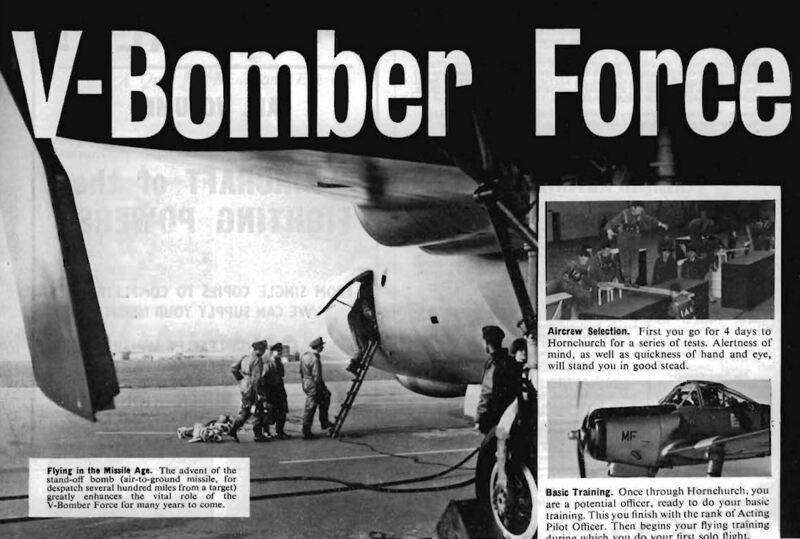 The advent of the stand-off bomb (air-to-ground missile, for despatch several hundred miles from a target) greatly enhances the vital role of the V-Bomber Force for many years to come. 6 ноября 1957г. : экипаж в составе У. Р. Геллатли и Дж. Г. П. Мортона выполнил в Уайт-Уолтхэме первый полет на прототипе винтокрыла Fairey Rotodyne. The Fairey Rotodyne has successfully achieved transition from vertical to horizontal flight. The upper stabilising fins have been fitted since the Rotodyne made its first flight last year. The North American T2J two-seat jet trainer flew for the first time on Friday, 31st January, and it is destined to be the U.S. Navy's basic trainer. It has a span of 36 ft.; length 38 ft. 4 in. ; height 14 ft. Maximum speed is 495 m.p.h. 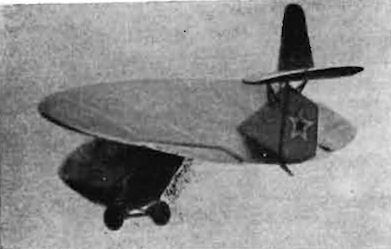 SARO CLOUD (1931) From an old album given to Jerzy Orwovski comes this novelty which baffled the experts - a tri-motor Saro Cloud. The reason for surprise is that very few people seem to recall the existence of a three-engined Cloud amphibian. Initially filled with three 220-h.p. Wright Whirlwind radials "for extra safety" (at the special request of the purchaser, the Hon. 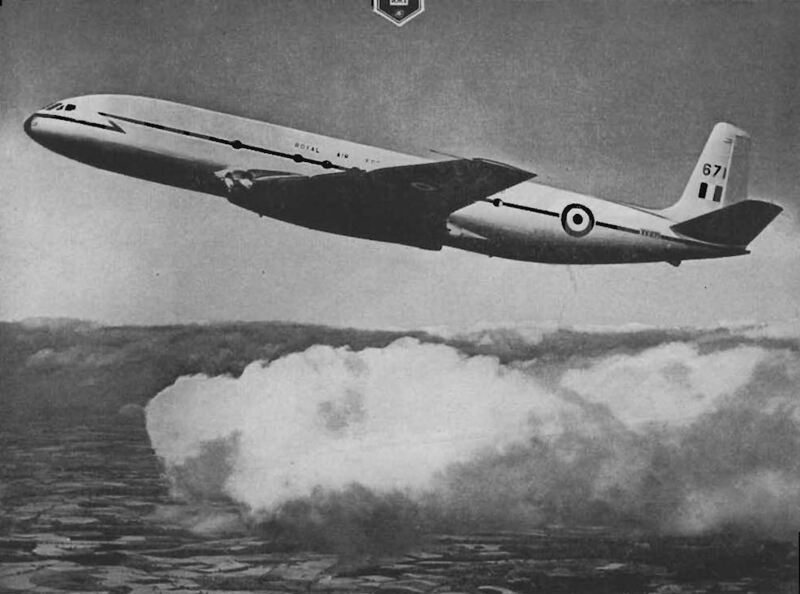 A. E. Guinness), G-ABHG was tested by Sq./Ldr. L. S. Ash, M.B.E., R.A.F.O. Later the Cloud was converted back to the conventional two-motor installation totalling 680 h.p. Span 64 ft.; length 51 ft.; weights: empty 6.250 lb., loaded 9,500 lb. ; speeds: maximum 118 m.p.h., cruise 95 m.p.h. ; service ceiling 12,000 ft. F.a.f. price ?9,000. Seventeen Clouds went to the R.A.F. in the mid-1930s as "flying classrooms". Rare Polish machine is illustrated here, the RWD-13. 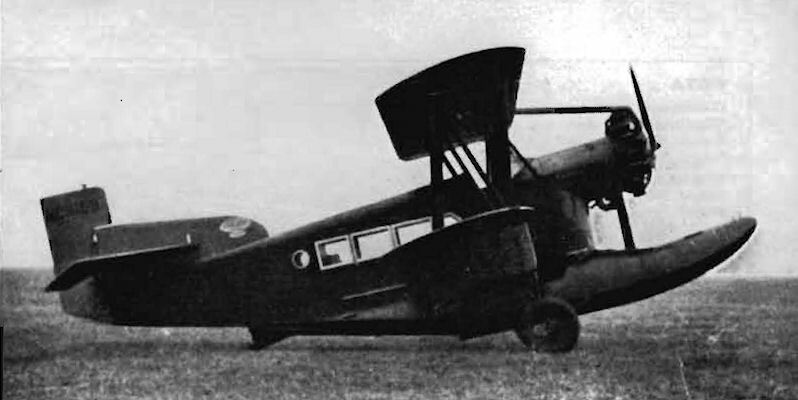 WACO MODEL UIC (1933). S.A.C. N. Dunmow, at present serving with the R.A.F. 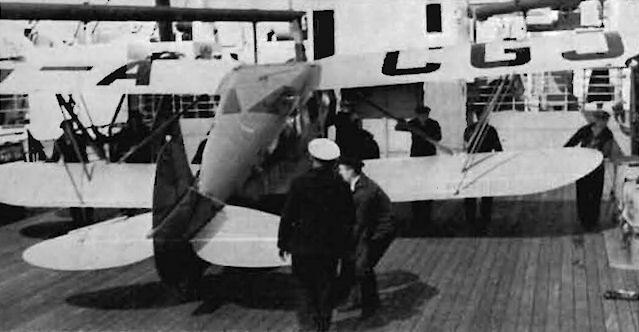 in Cyprus, has sent lo "Attic" this unusual photo of the only British-registered Waco Model UIC about to be off-loaded from a German vessel al Bremen in 1933. Owned by Lady Hay Drummond-Hay, this Heston-based Waco eventually went to Australia as VH-UAX. 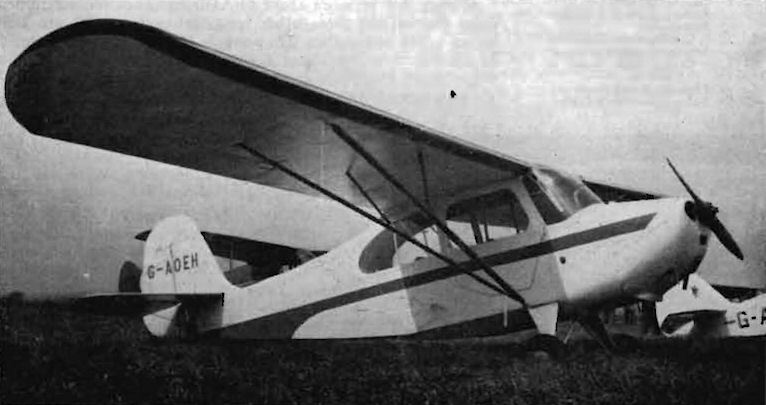 The lone Aeronca 7AC Champion G-AOEH, c/n 2144, owned by Mr. S.S.Miles, was formerly OO-TWF and N79845. Miss Joan Short's white Turbulent G-APIZ made its first public appearance at Goodwood on Easter Monday, having flown for the first time on 1st April. Basic Training. Once through Hornchurch, you are a potential officer, ready to do your basic training. This you finish with the rank of Acting Pilot Officer. Then begins your flying training during which you do your first solo flight. 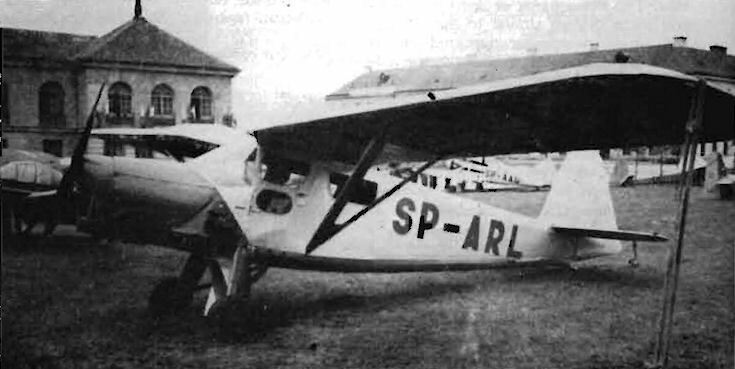 The first commercial aircraft to be registered in Ireland was this Desoutter II in August 1930. 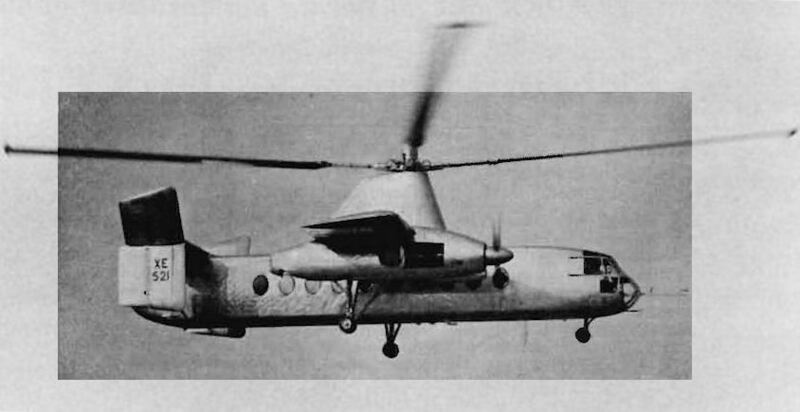 This is the Aer Lualdi L-55 four-seat helicopter, which recently made its first flight. The 180-h.p. Lycoming engine is mounted in the front of the fuselage and drives a two-bladed main rotor of 32.8 ft. The L-55 is 39 ft. in length, 12 ft. 6 in. high and has a gross weight of 2,400 lb. Maximum speed 95 m.p.h., cruising speed 80 m.p.h. Recently near Moscow there appeared at the height of about 4,000 ft. a strange, fast-moving object. To many it looked like the mysterious flying saucer beloved by the space fiction writer, but to the initiated it was the Diskoplan experimental single-seat circular wing glider. 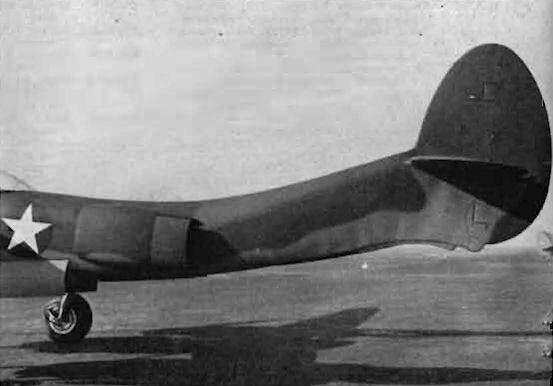 This photograph, the first to be published in the Western world of the Diskoplan, shows the glider to have a curious tail-plane-fin arrangement. It has normal controls of the trailing edge oj the wing and, one would guess, a fuselage boom which supports the wing. The Diskoplan is said to be extremely docile in flight and almost impossible to spin. A power version of the machine is to be built and will be powered by a light jet engine. Morane-Saulnier M.S. 1500 Epervier. 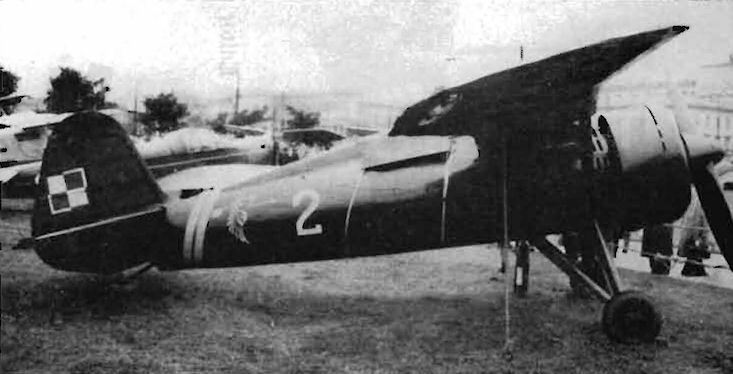 The first prototype of the Morane-Saulnier M.S. 1500 Epervier was recently completed and is now undergoing ground tests before embarking on a series of flight tests. The principles behind the design of the aircraft were: a robust light aircraft capable of being adapted for multifarious duties; cheap to produce; simple to build, and economy of operation. It also had to be capable of operating under adverse conditions, and to operate from unprepared fields and landing strips. 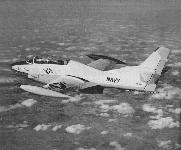 The prototype aircraft is fitted with a Turbomeca Marcadau turboprop engine of about 400 e.s.h.p. 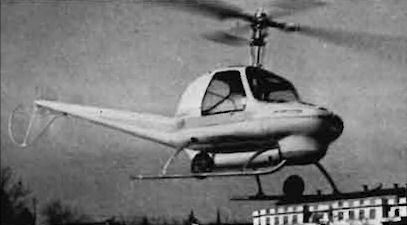 driving a two-bladed Ratier propeller, but later models will have the Turbomeca Bastan turboprop of 750 e.s.h.p. and a three-bladed propeller. The large bulged cockpit cover provides excellent all-round visibility, an asset when the machine is used for artillery observation duties. 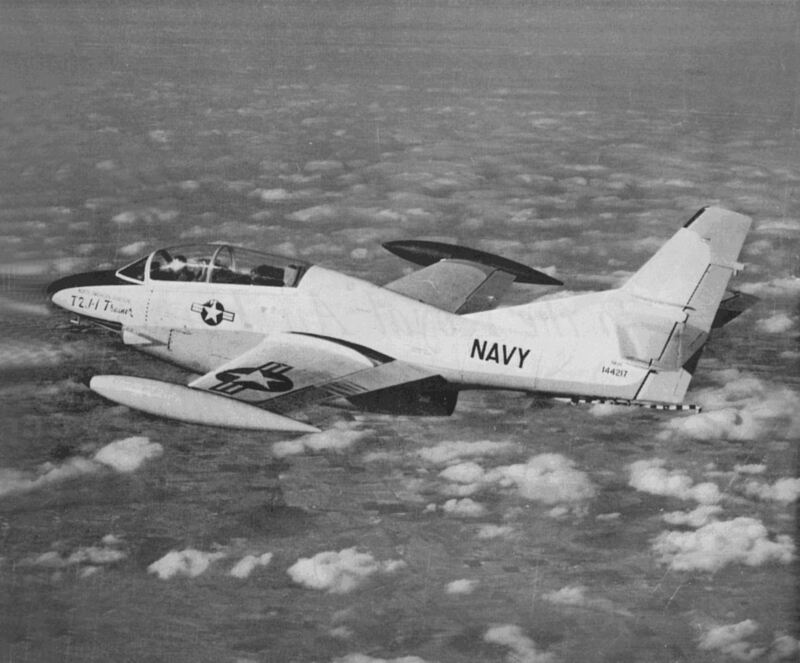 As a ground-support aircraft it can be armed with a variety of weapons under the wings, including 7.5-mm. machine guns, small-calibre bombs, air-to-air rockets, or SS-11 missiles. It can also be fitted with drop-tanks, and with these has a range of 750 miles. Armourplating around the cockpit protects the occupants against enemy ground fire. Finally it can be used as a training aircraft for pilots who are ready for advanced training. LOENING AMPHIBIAN (1930) From a negative supplied by H. H. Grant of Chatham (Kent) we have obtained a print of this Grover Loening Amphibian (NC9159) which was photographed at Mansion (Kent) on Friday, 15th August 1930. The occupants were a Mr. Marshall Field and a Mrs. Dudley Coals from the U.S.A.